The Plouffe Park outdoor winter rink is open 7 days a week to the public starting Saturday, January 5. Limited supervision is available throughout the 2019 skating season. 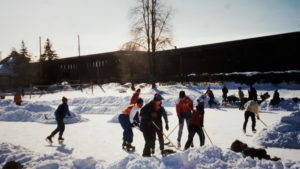 Volunteers Welcome – It takes a community to build a rink! The PPRA operates the Winter Rink in Plouffe Park with a grant from the City of Ottawa and the help of volunteers like you! Are you a high school student looking to earn your volunteer hours or a neighbour who loves to skate outdoors and wants to keep this tradition alive? We would love to hear from you – get in touch with us by email. Plouffe Park Rink in the News. Will The Tradition Continue?